.... to Edinburgh, where he took daily lessons with the 80-year-old master Paddy Atkinson. During the day, he practised in Paddy's garden arbour, at night (because of the neighbours) he practised in the woods. For several years, he kept coming back to Edinburgh, until he had an adequate command of the instrument. Following publication of a record featuring bagpipe music in disco style in 1979 and the lucky encounter with the experienced and very successful arranger, producer and composer Uli Roever (who worked, among others, for Udo Jürgens and Peter Maffay), after the production of the single records "Highland Games"/"Lonely Piper" and "Dreamy Island"/"Devils Dance" "Highland Cathedral" was jointly developed and also published as a single in 1982 together with the title "By The Right-Quick-March". The two makers were convinced of its chances of success. The tune has found its way into people´s hearts all over the world - sometimes in an unusual way. 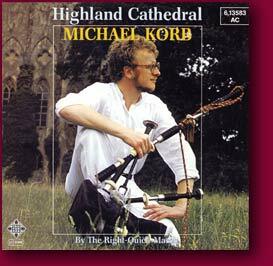 "Highland Cathedral" was produced, arranged and composed by Uli Roever and Michael Korb and published as single in 1982. This original version is contained on this CD. 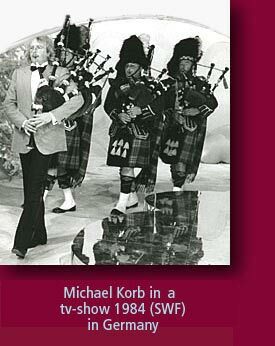 It is interpreted by Michael Korb on bagpipe. Since then, the composition has been published internationally on various sound media 882 times by different artists. In the majority of cases, the title was published in its traditional instrumentation of pipes & drums. But other interesting, classical and symphonic versions have met with great interest, too (www.relrecords.com). 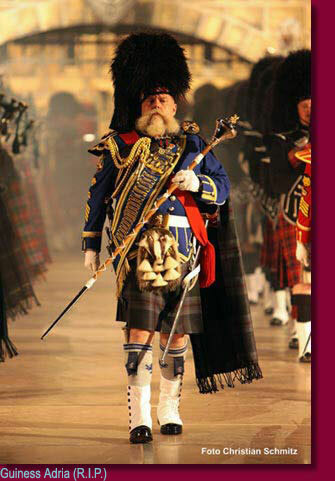 The pipes & drums and military band of "The Royal Highland Fusiliers" with pipemajor Gavin Stoddart was the first band who published "Highland Cathedral" - in 1986 on their album "Proud Heritage". The song has also been published in German: "Steh wieder auf" and "Du bes die Stadt" (Highland Cathedral - Wikipedia), Hilary Bell sang "Always you" in English and Amy Grant published "Highland Cathedral" in America on her CD "A Christmas to Remember". The composition also attracted attention when being performed on large events with military bands with up to 800 musicians. "Highland Cathedral" was orchestrated impressively at the "Waldbühne" in Berlin and at the finale of the famous Royal Edinburgh Military Tattoo. The famous and world's best bagpiper Angus MacDonald included the sheet music of "Highland Cathedral" in his famous sheet music collection of selected bagpipe tunes "The Collection". "Highland Cathedral" was the Royal Hong Kong Police Anthem under the British rule which ended in 1997. It was played at a ceremonial lowering of the Governor's flag at Chris Patten's residence, Government House on the last day of British rule. "Highland Cathedral" is Chris Patten's favourite pipe tune as said by himself on a BBC Asia Today programme. "Highland Cathedral" is also a popular wedding song. "Highland Cathedral" was featured in one of the most famous British film productions "Four Weddings and a Funeral". Pop queen Madonna chose "Highland Cathedral" for her church wedding ceremony in Scotland (December 2000). In 2013 the Thomas Heuer from the city of Berlin in Germany wrote the wedding-lyrics "Liebe für die Ewigkeit" in German and "Will She Marry Me" in English for "Highland Cathedral". Also Phil Coulter produced and arranged his version of "Highland Cathedral". His recording of the same title held the top position in the German "Klassik Radio" charts in December 2000. In the USA, a film documentation "Tribute to Wayne" about the famous icehockey- player Wayne Gretzky featured "Highland Cathedral".Another film documentation with the title "Gloria & Pipers" featuring "Highland Cathedral" was published in the USA. In December 2001, "Highland Cathedral" was performed concertante before the Royal Family, in the presence of the Queen, in a festivity on the occasion of the "Remembrance Day" at the Royal Albert Hall (broadcast on television by the BBC). One of the famous bagpipe bands, the "Royal Scots Dragoon Guards", who was awarded 14 Golden Records in 1972 for their wold-wide hit "Amazing Grace", has now published the CD "Highland Cathedral" and a DVD with the same title - a musical film production with beautiful impressions of Scotland (and more CDs with "Highland Cathedral" (www.scotdisc.co.uk). 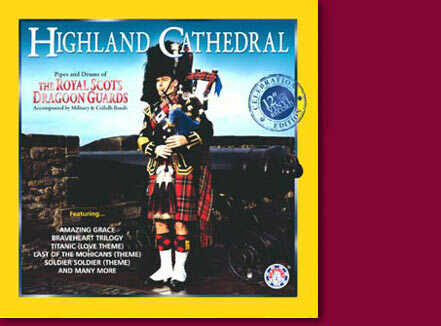 The CD "Highland Cathedral" by the "Royal Scots Dragoon Guards" has become a bestseller and the most successful bagpipe CD in world. In Great Britain, the CD "Spirit of the Glen" by the "Royal Scots Dragoon Guards" with another wonderful interpretation of "Highland Cathedral" was voted as Album of the Year 2009. 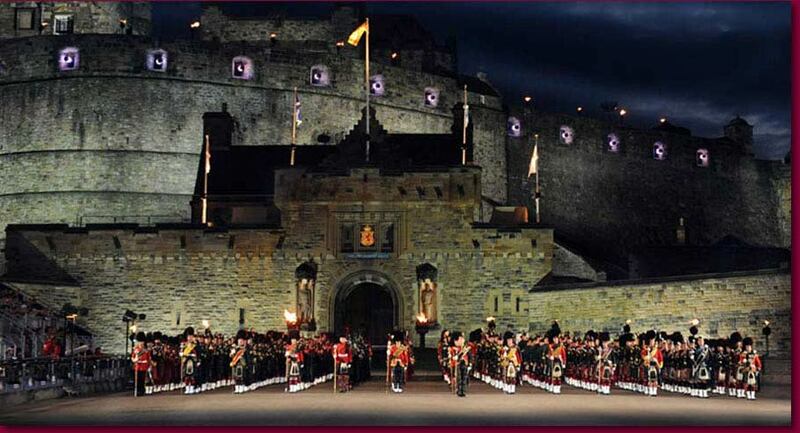 Together with 600 performers, the "Royal Scots Dragoon Guards", effectively staged "Highland Cathedral" once again in the finale of the world-famous Edinburgh Tattoo Festival 2004, 2006, 2009 and 2012. Mr. Brigadier Melville Jameson, who has been responsible for the worldwide popularity of the Royal Edinburgh Military Tattoo for 12 years now and for this reason enjoys utmost international reputation, staged this event spectacularly in 2006, too. 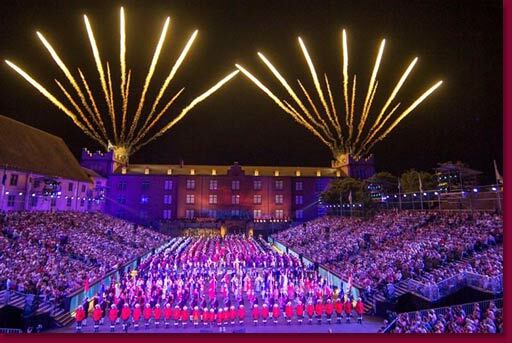 In the finale, 600 musicians in 13 bagpipe bands presented Highland Cathedral with a brilliant display of fireworks as an exquisite sound experience. Also the invited guests of honour, Princess Anne and the charismatic global actor Sean Connery, were extremely enthusiastic about the probably best Royal Edinburgh Military Tattoo 2006 ever. 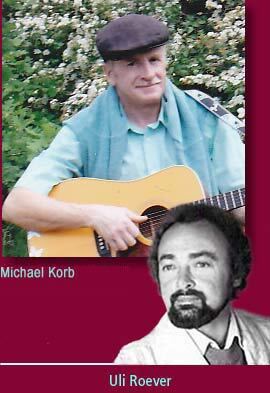 Both a CD and a DVD of this concert have been produced. The BBC recorded the event for the purpose of global TV broadcast. In addition, Mr. Jameson produced the CD Edinburgh Military Tattoo Tribute, on which he compiled Highland Cathedral together with the most beautiful musical performances on the occasion of the 12th anniversary of his reputable production management in a special edition. In the year 2001 the fabulous album Highland Cathedral - interpreted by Phil Coulter - was nominated for the Grammy award (New Age). For years the press media and even the Scottish Parliament have been debating the question whether Highland Cathedral should become Scotlands new national anthem. In this context, the Royal Scottish National Orchestra gave a concert in Edinburgh in June 2006, in which Highland Cathedral competed together with Scotlands most popular songs in a public contest to become the new national anthem. Highland Cathedral is broadcast internationally in the 15-part TV series First Dance. 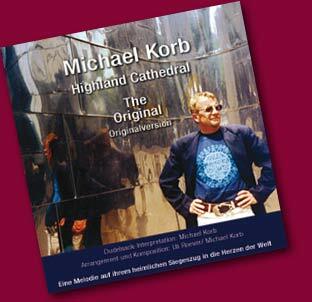 The original "Highland Cathedral" CD is available via e-mail: M.Korb@gmx.de. "Highland Cathedral" was performed with 1500 artists in front of an enthusiastic audience from February 5 to 7, 2010 at the sold-out Sydney Stadium on the occasion of the special guest performance "The Royal Edinburgh Military Tattoo in Australia". According to the organizers this event was the biggest Scots Festival of all times. The pipeband "The Crossed Swords" introduced "Highland Cathedral" at the Tattoo 2010 in Moscow. The Californian bagpipe band "Caber Feidh" has published it latest CD "Out of the Glen" containing "Highland Cathedral". This band has become famous all over the world because of their spectacular appearance in great Hollywood movies ( "The Fugative" with Harrison Ford). 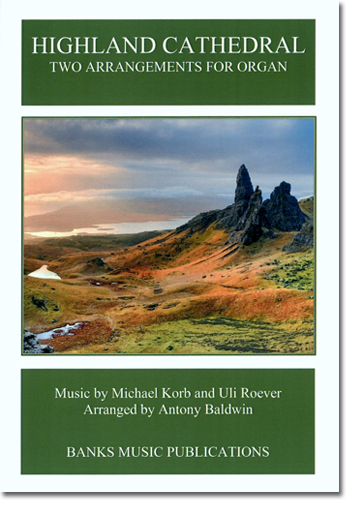 Antony Baldwin has written two wonderful arrangements of "Highland Cathedral" (composed by Uli Roever & Michael Korb). The organplayer Ockie Vermeulen published in South Africa his CD "Highland Cathedral" which has been met with critical acclaims. This CD was topping the South Africa Charts for over 62 consecutive weeks (youtube). Cantor Heinz-Jacob Spelmanns from Düsseldorf, who has been enjoying for many years great success in concerts with his ensemble "Musica Variata" consisting of musicans Johan Kohlhaus and Klaus Glocksin (Band: "The Rhine Area Pipes & Drums"), has won over classic fans in particular with his sacral, virtuoso organ arrangement of "Highland Cathedral" in the style of Johann Sebastian Bach (CD Koch Schwann / Musica Mundi). 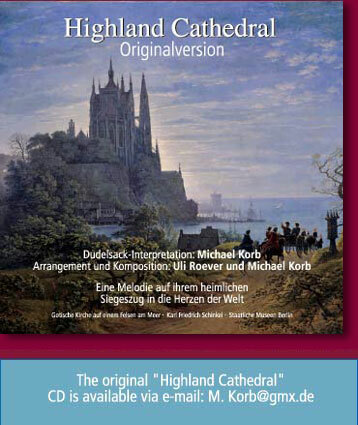 The special sacral score from Heinz-Jacob Spelmans for organ, flute and pipes/trombone of the composition "Highland Cathedral" from Uli Roever and Michael Korb is available. Please contact via e-mail. and at the British music publisher Safe Music or at Henry Funke - Exciting Brass Quintett. On the occasion of the visit by Pope Benedikt XVI. to Scotland on September 16, 2010, 1000 bagpipers had welcome the Holy Father during his passage along famous Princess Street in Edinburgh with their performance of "Highland Cathedral"
The international popularity of the composition "Highland Cathedral" has induced the Scottish clothing company "House of Edgar" to create and produce a special pattern in the tradition of Scottish tartans that bears the same name. The tartan "Highland Cathedral" is now registered in the official Register of Tartans in Scotland. In Scotland "Highland Cathedral" has recently been made suitable for the dancefloor in a contemporary version by DJs Ess & Gee. "SCOTTISH clubfever" is the 368th international new production (coverversion) of "Highland Cathedral" by other artists. 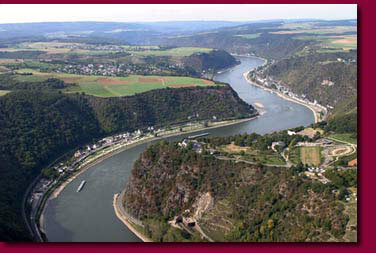 The long-established Cologne-based "institution" and cult-group "Bläck Fööss" published their special text version of "Highland Cathedral" as musical Declaration of love to Cologne in a manner typical for the Rhineland ("Du bes die Stadt") on the occasion of carnival 2003. This title of the album "KBF33" reached position 24 of the German charts on 27. January 2003. 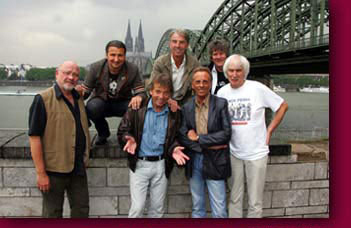 For the 40th stage anniversary of the legendary Cologne band "Bläck Fööss" readers of the newspaper "Kölnische Rundschau" voted the most popular songs, the Top Ten, by this band. With 1947 votes "Du bes die Stadt"/ "Highland Cathedral" was selected No. 1. 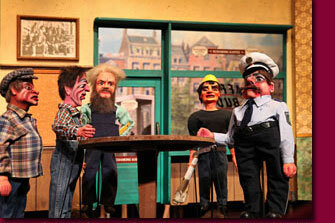 Even in the venerable "Hänneschen-Theater" in Cologne, which was founded way back in 1802, the famous puppets have been performing a new musical play since 2013 in Rhineland dialect with songs by the "Bläck Fööss" including, of course, their city hymn "Du bes die Stadt/Highland Cathedral"
In the internet on You Tube users have clicked and viewed the video "Musikschau der Nationen" with "Highland Cathedral" already ca. 2 millions times. Viewers have sent thousands of enthusiastic comments, which are also published there. 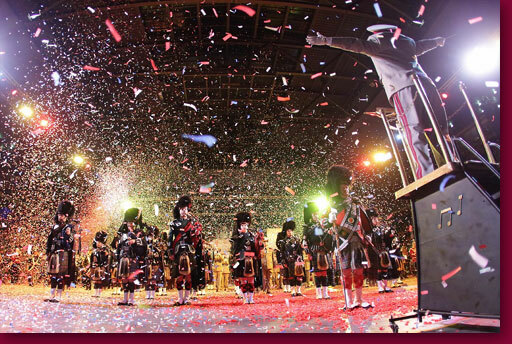 The monumental "Music Show Scotland" has been touring through Europe since 2011 as the world's biggest indoor show production of its kind with 120 pipers, 45 dancers and a band of 20 musicians. In particular, these artists under the special direction of Hans Beerten/Guiness Adria (R.I.P.) together with the famous "Royal Scots Dragoon Guards" received standing ovations for the excellent performance of "Highland Cathedral" in sold-out concerts so far. 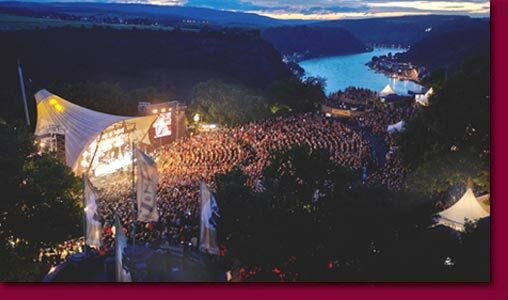 In 2011 the successful concert manager Ulrich Lautenschläger initiated the Loreley Tattoo with "Highland Cathedral" for the beautiful open-air stage on the famous Loreley rock on the Rhine at St.Goarshausen. These concerts were so successful that he also orchestrated the first Deutschland Tattoo for the gigantic Veltins Arena (Schalke) in Gelsenkirchen on September 7, 2013 (arranged and conducted by the Director of Music Mr. Major Jason Griffiths). In the finale, "Highland Cathedral" was performed by the world´s largest bagpipe formation and a huge fireworks. 800 bagpipers volunteered for this event and set up a new world record with their performance. 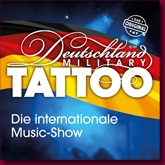 Since 2013 Mr. Lautenschläger orchestrated the Deutschland Tattoo every year. The British newspaper "Daily Mirror" has been looking out in a competition for the best choir to interpret the popular version "Highland Cathedral - My Heart, My Home" at the festive opening of the "Commonwealth Games" 2014 in Glasgow (music: Uli Roever and Michael Korb, lyrics: Dr. Simon Paterson-Brown and Christopher Thomson). 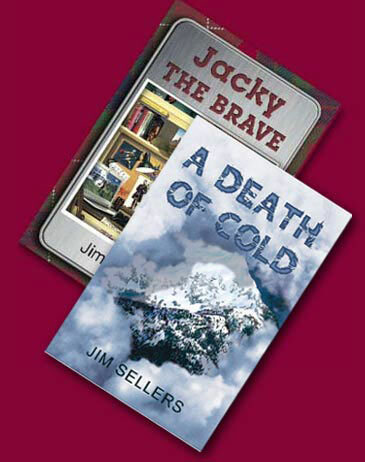 "These books feature the timeless and hauntingly beautiful composition ´Highland Cathedral´, which also plays a pivotal role in the stories of Jacky." "Highland Cathedral" is played before all international Scottish rugby matches at Murrayfield in Scotland. In 2014 Ainsley Hart and Allan Watts published in Australia the profound teaching book "The School Piping Tutor" with the written music of "Highland Cathedral". The well-known British singer Eve Graham ("I'd Like To Teach The World To Sing") for a second time recorded the composition "Highland Cathedral" by Uli Roever & Michael Korb, this time in the arrangement of the American Larry Hall with the Christian lyrics of the American Duane Kellogg "Love Won The Fight". 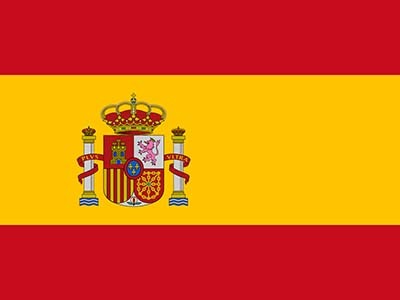 In 2015 the spanish pop group "Batemento" published with original spanish pipes from Galizia on their new brilliant album "Overture" in an innovative arrangement their own interpretation of "Highland Cathedral". The society of the "Drehorgel-Club" in Switzerland under the direction of Peter Bürgisser is playing successful "Highland Cathedral" on the hurdy-gurdy. 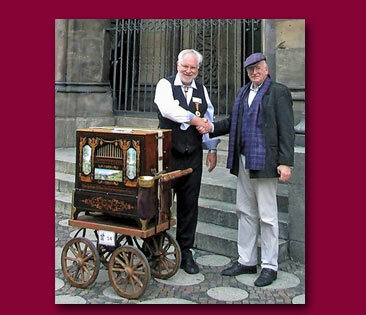 At a lot of street-organ festivals and even in the famous abbey cathedral of Einsiedeln in Switzerland and in the famous church of Berlin "Kaiser-Wilhelm-Gedächtniskirche"
nearly 1000 spectators were enthused. The film "Banding Together" directed by Angelica Kroeger and produced by Elena Rubio-Hall will feature "Highland Cathedral" performed by a Scottish school pipe band. The film will be handed in to some film festivals. The famous and celebrated chanteuse Mirusia, who is also very successful performing with André Rieu, released her new album in 2017. It was her heart´s desire to introduce on this album "Highland Cathedral" composed by Uli Roever and Michael Korb with the lyrics "Within My Heart" written for her by Graeme Press. 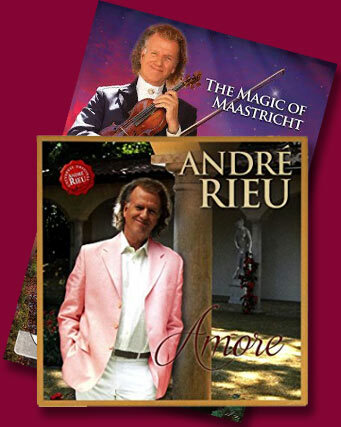 The world-famous artist André Rieu presents his new album "Amore" and the DVD "The Magic Of Maastricht" with the composition "Highland Cathedral" (Uli Roever & Michael Korb). 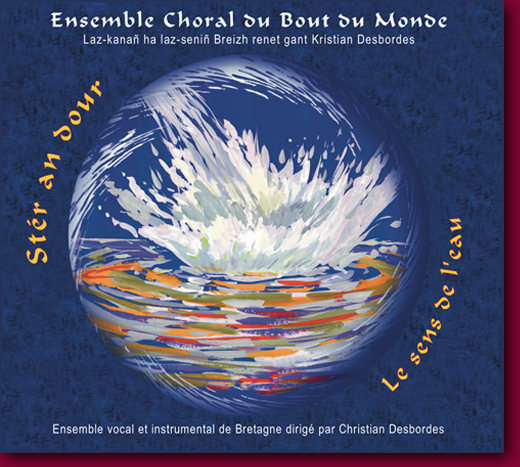 Jean-Marc Kernin) on the new album "Stér an Dour" (www.ecbm.bzh).